A few weeks into the school year, her seventh grade daughter was coming home daily in tears because of continued harassment by another student. She was a bright girl, but was bored stiff in a classroom that didn’t allow her to go beyond the school’s agenda. “Please, can’t you homeschool me too?” she begged her mother. So, in 1986, with textbooks purchased from the local private school and some borrowed library books, Julie found herself homeschooling her two children. “We’ll just try it for a week,” she reasoned. That week became years. I was the seventh-grade daughter. I never went back to “regular” school … and my brother never had another seizure. Fast forward a few decades. Homeschooling has gone from being “weird” to somewhat common. Almost everyone knows someone who homeschools. And estimates are that 2–3 million American children are now experiencing a very different type of education than their parents did. passing on faith and values. There weren’t a lot of homeschool resources available back in the ’80s, but with ingenuity and determination parents like my mother successfully taught their kids. Today, my generation of homeschoolers is all grown up, and the support and resources available for parents to teach their own children have vastly increased. There are complete boxed curricula, online courses, DVDs, homeschool co-ops, homeschool magazines, and hundreds of companies that cater to the needs, learning styles, and varying interests of students and their parents. If you’re looking to homeschool one or more of your children, your first stop should be the website of the Home School Legal Defense Association (HSLDA.org) where you can check out legal requirements for your state. Homeschooling is legal in all fifty states, but there are different requirements in each state. For example, South Dakota (where I live) requires parents to fill out an annual exemption form, do standardized testing in certain grades, and teach at a minimum the topics of “language arts and math” for “an equivalent amount of time” as the public school. Even if your state doesn’t have an overall homeschool organization, small independent groups can be found within driving distance of just about every family in the country. Our local all-volunteer group serves a wide range of families from up to an hour away. We have field trips, “Friday Classes,” holiday parties, and public service events. Many of our members found us via our Facebook page or a Google search. HomeschoolNowUSA.com may also help direct you to local homeschool organizations and events near you. There are many blogs and websites that focus on homeschooling families. One such site is TryHomeschooling.com, where you can download articles on organizing your homeschool, issuing report cards, creating high school transcripts, keeping a portfolio, dealing with special needs, and much more. 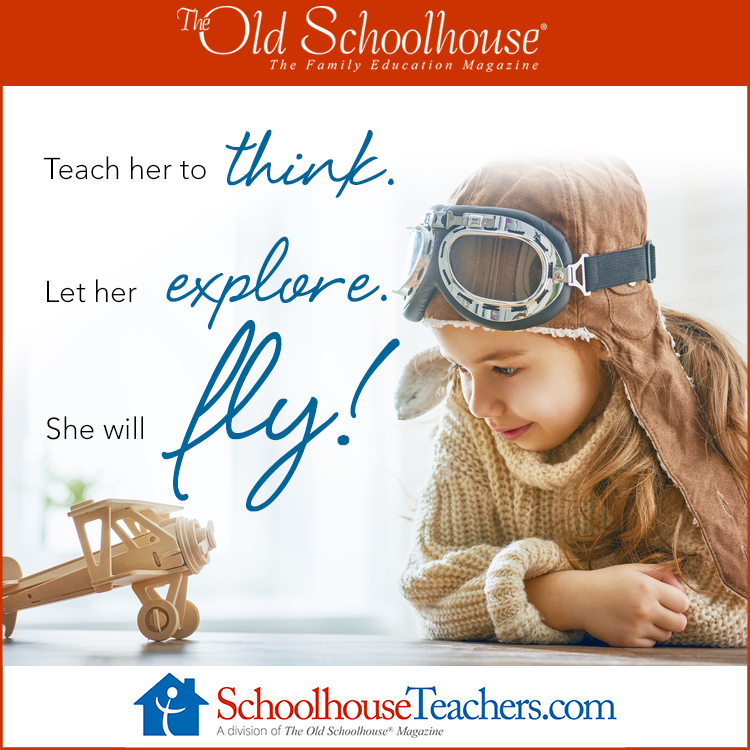 The Old Schoolhouse® Magazine is considered the “trade magazine” for homeschool families, and is available for free online at www.TOSMagazine.com. It provides dozens of encouraging and valuable homeschool articles with each issue. There are many different “styles” of homeschooling. You will likely find a style that fits your family’s needs, or you may decide on a blend of two or more styles. In some families (like mine), you may see that one style works great for one child, but another child responds better to a different style. Knowing your particular style is not required to homeschool, but it can help narrow your search for curriculum and provide structure as you are becoming more comfortable with homeschooling. Another possibility is www.SchoolhouseTeachers.com. It’s an online one-stop resource that can be used for your entire family at one low monthly price. You don’t have to purchase additional books, just access online and print off what is needed for the lessons your child needs to do. Many families use this as their sole curriculum, but it can also be used to supplement other programs. Members have access to almost two-hundred courses (preschool through 12th grade), from core subjects like math, science, history, and language arts, to classes like computer programming, Shakespeare, foreign language, fitness, and even film-making. Take a look at all of the courses here: https://schoolhouseteachers.com/member-resources/quick-links/. You don’t have to have a teaching degree to educate your children at home. You’ve been teaching them from the time they were born—how to walk, how to talk, how to tie their shoes, and to know their letters and numbers. Teaching them to read, do math, enjoy science, and love to learn are just the next logical steps in your parenting journey. Though you will have difficult days (we ALL do!) and you may question your ability from time to time, there are resources and support for every obstacle you may encounter. The lasting rewards that come from teaching your children at home cannot be overstated. And if you ever said, “I could never homeschool my kids!” don’t worry. You won’t be the first to find out that you can.